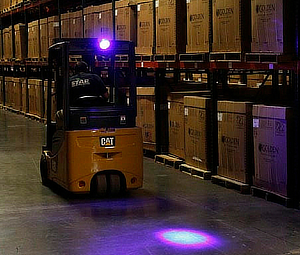 Extra headlight warns warehouse workers of approaching vehicles. Forklifts are crucial tools for moving heavy loads in bustling DCs, but when mistakes or errors occur, the results can be fatal. Now, a Tampa, Fla., company has launched a product for keeping forklift drivers and the pedestrians around them safe, without slowing the pace of work. Marketed by electronic safety and weighing device maker Keytroller LLC, the Forewarner LED warning spotlight shines a brightly illuminated blue or red spot on the floor directly in the path of a forklift's motion. The unique light spot warns pedestrians and other vehicles that a forklift is operating in the area. The warning spotlight on the floor is particularly effective on forklifts exiting an aisle or a trailer, giving a visual warning to those in intersecting aisles, the company says. The symbol acts as an extra warning to traditional backup audio alarms that tend to blend into the ambient noise in a busy building.